I bought just the one. 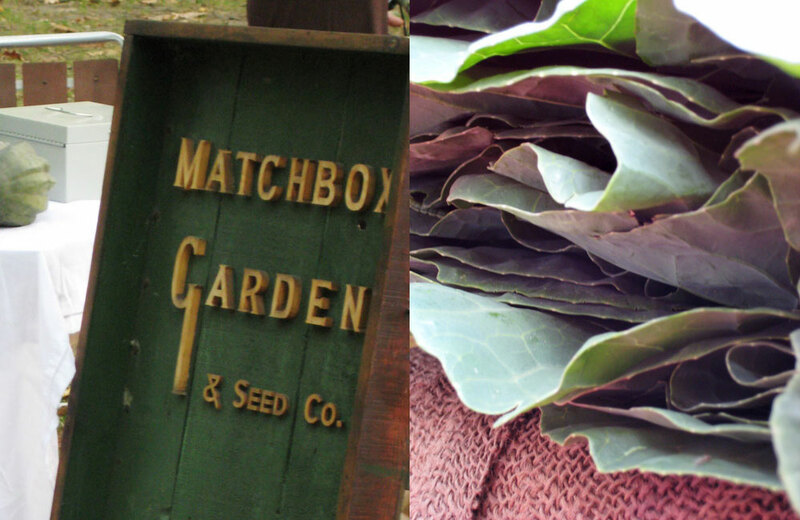 Still a little green, I put it gently in a paper bag and, testing it once every day, waited patiently until it was. Just. Perfect. And devoured it slowly, if such a thing is possible, with a hand made, raw milk, sheep cheese. Growing up mostly vegetarian as I did, it took my Mother-in-law to introduce me to the wonders of Meaty Comfort Foods, such as bolognese, cannelloni and lasagna. I loved when we went to their house for a Sunday dinner and instead of a traditional roast and two veg, there was a juicy, aromatic dish of pasta al fourno bubbling happily away in the oven. 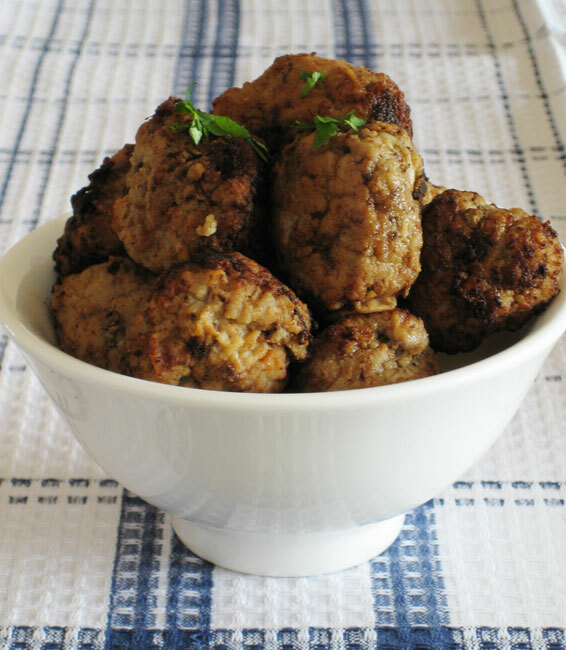 These little meat balls, stuffed with a cube of good dutch cheese, went down in a gobble and a gulp from a very satisfied Mr P, half Dutch as he is. The meat balls take a bit (though not much) of fiddling and it’s a good idea to start them a little in advance, say 45 mins before you want to eat, but the rest of the meal is dead simple: just a pot of good pasta on to boil and the simplest of tomato sauces. I made my sauce with a can of whole, peeled, Italian Plum tomatoes, some salt, some sugar and a good dollop of really good Olive oil, just boiled away for 20 mins while I carried on with the meat balls. – fry the balls in batches in the hot oil. Turn frequently to brown all over. 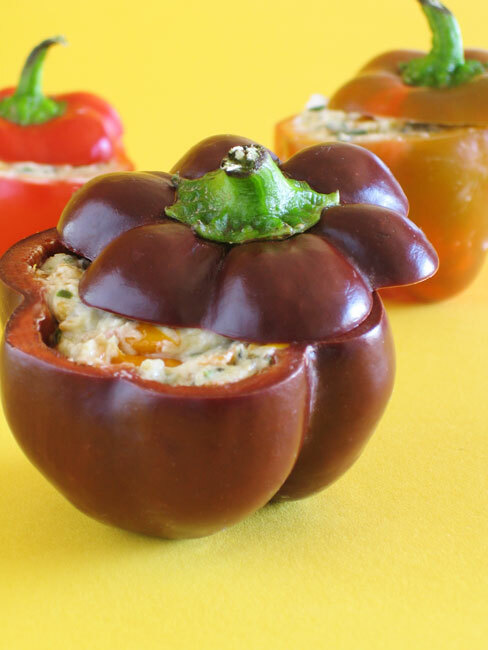 – Serve with pasta and tomato sauce. 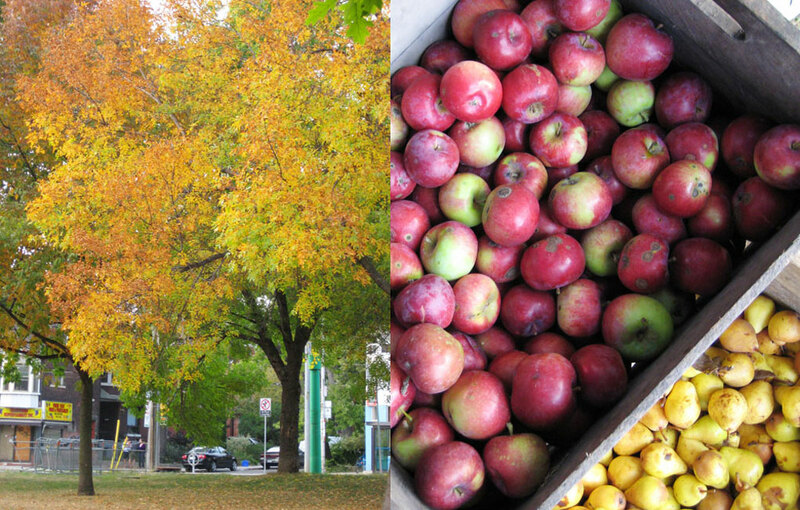 We’re still having our love affair with an Indian Summer here in TO. The evenings remind us that the season is changing, but the days are still above 20˚C. Fall is mushroom season, though, and even though it’s warm out, a nice comfort dish at night is in the calling. After all the salads and crisp fruit and veg, it was fun to eat something as soft and warm and aromatic as this. 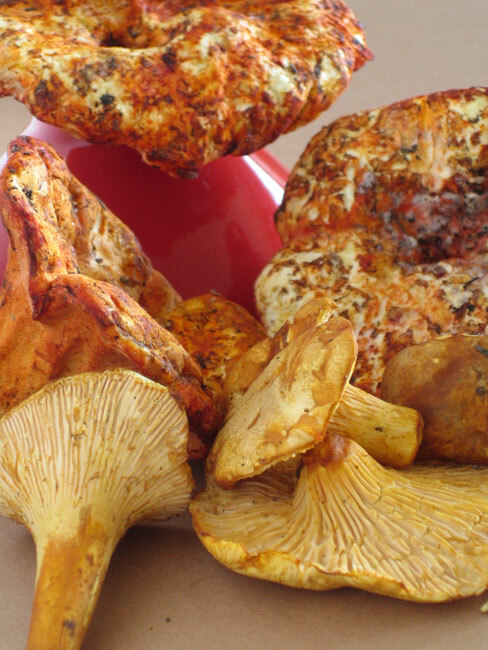 Besides, how could anyone resist such colourful, strange, beautiful and ugly looking mushrooms? Does anyone know what they are? 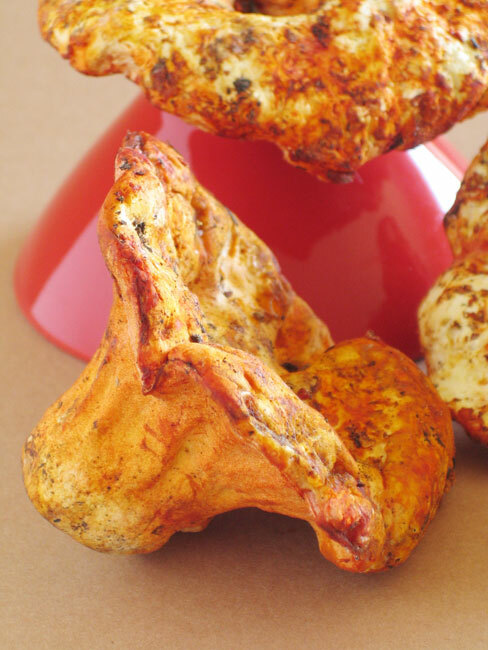 – if using Chantrell mushrooms, keep a handful aside, to add right at the end, to preserve their delicate flavour. – roughly chop the mushrooms. Take half of them and process in the food processor until finely chopped. – heat the oil in a large saucepan/skillet on a medium heat. Saute the shallot and garlic for a few minutes, then add the mushrooms. Season with thyme, salt and pepper. When the mushrooms are tender, add a bit of lemon juice and taste the mushrooms to make sure they’re good. 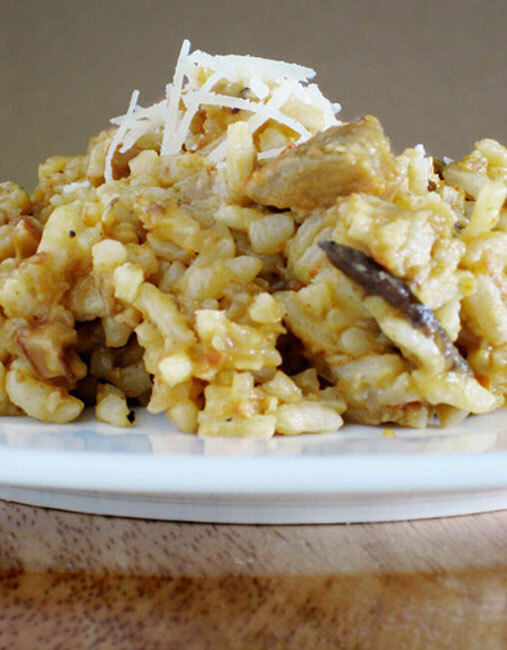 – remove half the mushroom mixture from the pan and reserve. Add the rice to the remaining mushrooms in the pan and stir constantly. The rice will start going translucent and might pop a little. – Now add the wine and stir until it’s all cooked off. – Turn up the heat a little on the hob and start adding the stock, about a cup at a time, stirring until it’s absorbed. Make sure the last lot of stock is absorbed before adding the next cup. This will probably take 15 – 20 minutes. – about half way through the stock supply, re-add the rest of the mushroom mix and continue with the stock. Add the remainder Chantrell mushrooms now, if using. 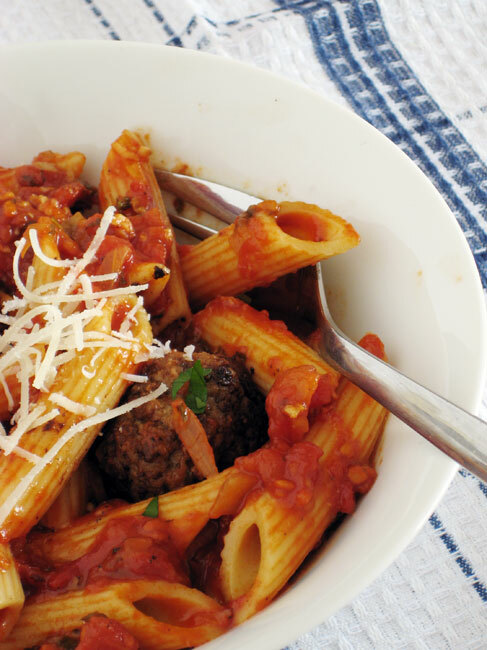 – just before serving, add the Parmesan. Serve with fresh ground black pepper and extra parmesan. Oh, we thought the Autumn was going to arrive early a few weeks back when the temperature suddenly dropped. But no. All that did was help to turn the trees, while the temperatures climbed back up to equal the glory days of Summer. Wonderful! But who wants to be cooking in this weather? 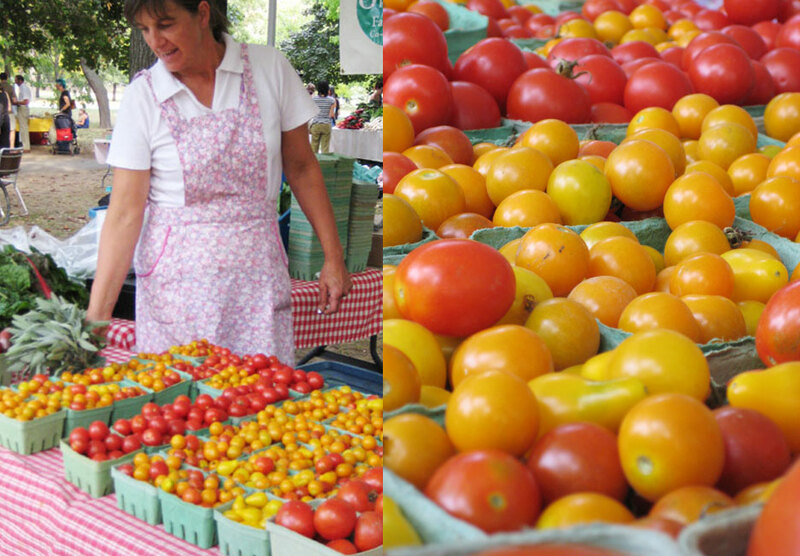 I’d rather be sitting in the park, sharing a bag of all-too-perfect, sweet and salty and crisp and juicy, baby plum tomatoes with a good friend, watching life go by at the Farmers Market. 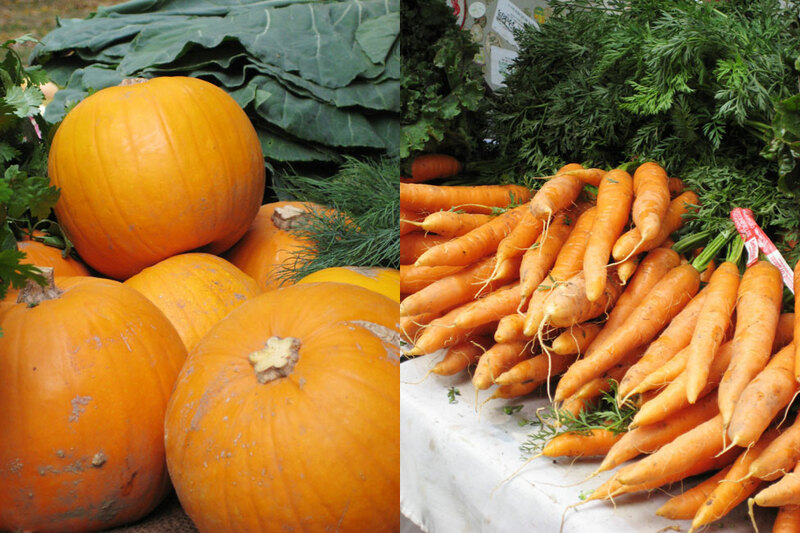 There’s a definite undercurrent of excitement at the market. We all know the days are numbered and that makes each one feel so much more special, makes everyone absorb every minute with the maximum amount of pleasure. Oh it’s just been the best Summer ever. I’ve been using Mr P’s camera for the last while to take blog photographs, seeing as how I’m still a poor and starving artist. Wait. Did I just say ‘starving’? Well, hardly, but I’m still holding out for the camera I long for and in the interim I’m a Borrower. On Sunday I did something I’ve never done before, trained as I am with the reflexes of a cat (ahem) and dropped Mr P’s appropriated private possession, destroying the focus and retraction on the lens. Not wanting to beat about the bush for too long I ran out at first light, well 10am when the shops opened doors you must be a stickler for detail, and purchased a replacement model, which is shiny and new, with bells and whistles (the old one just had the bells) and fits in to the hand like it was born to be there. The proof of the pudding, as always in this house, is in the eating, so we’ll have to wait and see the first foodie photo’s it takes before we judge. In the mean time, perhaps I could interest you in a little something something for that sweet tooth. A little derivative from Sylivie, who somehow always leaves me feeling a little breathless and under qualified in the baking department. *note: this recipe needs about 6 hours in the fridge, preferably overnight. It’s great for entertaining as you can make the shells and filling the day before and just whip up and decorate the tarts before your guests arrive. – beat the butter with the almond flour, salt and sugar until creamy. – add the egg, vanilla and 1 Tbsp of the flour and beat until smooth. – remove from oven, remove paper and legumes, bake empty tart shells another 7 – 10 mins until pastry is coming away from the sides of the tins and is “singing”. 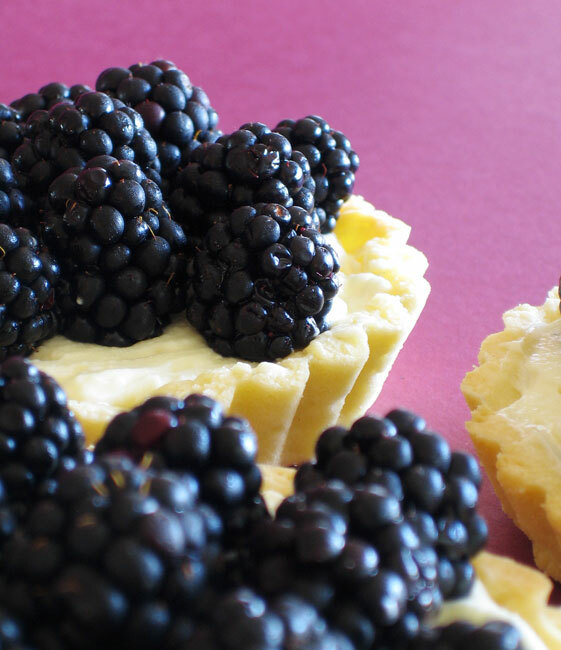 – cool tart shells to room temperature. – when the ganache is smooth, remove from heat to cool a bit. Add the rest of the cream and chill in the fridge for at least 4 hours, or overnight. – whip the chocolate cream until it’s stiff. It whips up really quickly. 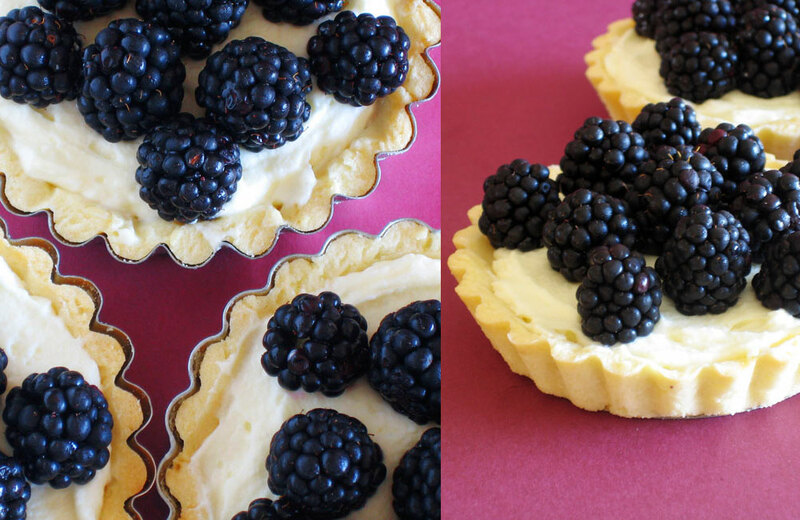 – fill the baked tart shells and top with black berries. 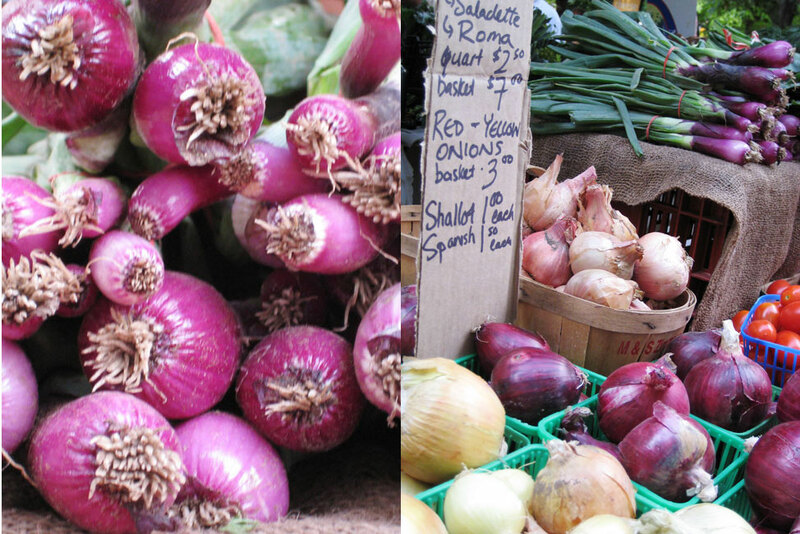 The weather is starting to turn now and I’m reminded every week at the Framers Market in the park that the days of fresh, local produce are coming to an end. Which was one of the main factors behind my decision to cook a whole meal with this fresh produce last week for friends, and these little, plump globes of fun colours were just too tempting to ignore. Such a lovely, fun thing to start an evening off with, too. A little plate of amuses bouche over the first bottle of wine while everyone exchanges greetings and catches up on tidbits of news. They went down a treat, still hot from the oven, oozing and juicy and super scrumptious. Don’t expect the the unwritten rule of nobody-eat-the-last-one-on-the-plate to be observed with these tasty morsels. 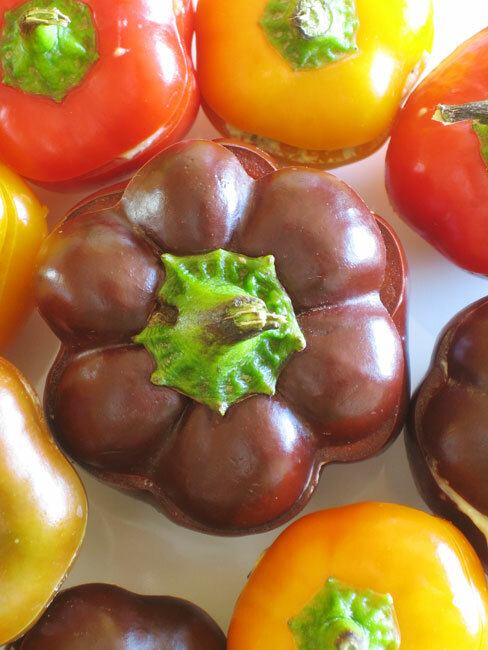 – cut the tops off the peppers, de-seed, rinse and dry on paper towel. Reserve tops. – put basil, pine nuts, garlic and oil in a food processor (or mortar and pestle) and process to form a pesto consistency. Add olive oil and mix well. – halve the tomatoes and pulse in a processor a few times to pulp some of them. Chop up any big pieces that stand out. -mix cheese, tomatoes, pesto and salt and pepper to taste. 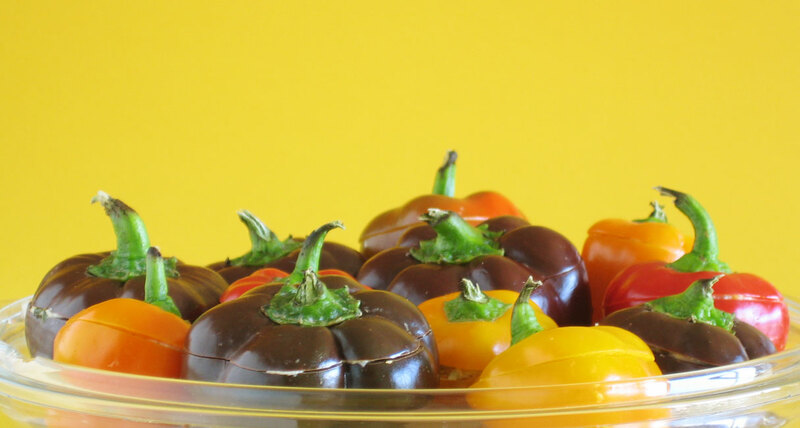 – fill each pepper, replace top and bake 20 mins. Allow to cool a bit before serving. I’m a tart for a tart, if you know what I mean. It seems to me that not that many people make tarts and pies in their own homes because they perceive making pastry as too much work and trouble to bother with. Much easier to make a cake, non? Well, the truth is that I love making pastry. And I don’t just mean in the eating thereof. I mean the whole shoopshebang of it. I love getting my fingers involved in a pate brise, I love having the ball of dough shaped in my hands before it goes in the fridge and I love, love, love rolling it all out on a floured work surface. It seems such an elemental thing, one of the simple pleasures in life, the antithesis of the rush and grind of everyday chores and work loads. When I’m in a bit of a grump, sometimes there’s nothing for it all but a bit of dough therapy. Of course, there’s an infinite amount of satisfaction in eating a freshly baked bit of pastry, filled with what-have-you, don’t you agree? Oh, and when you’re cooking for friends, who doesn’t love a bit of an after dinner tart? 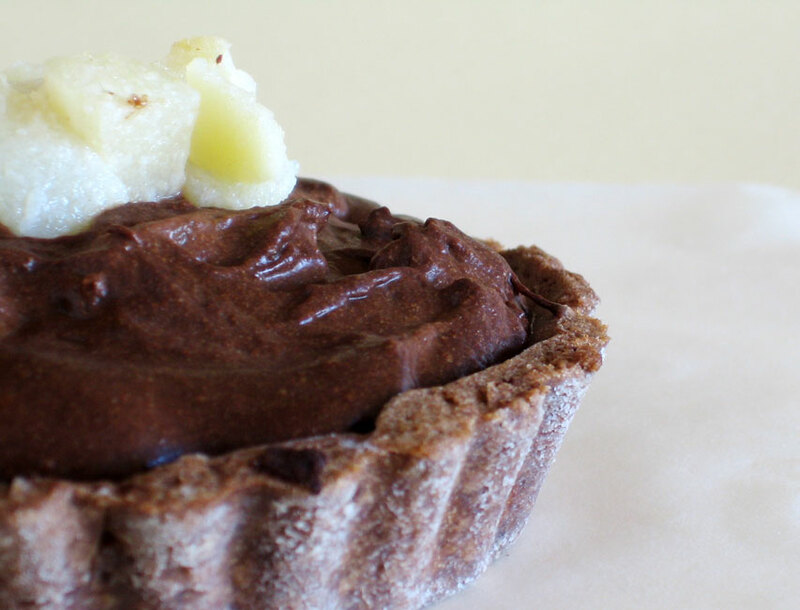 *note: the pastry for this tart is a Pate Sable, which needs to be worked with really cold or it’ll be to soft to roll, so make sure you refrigerate the dough for at least an hour. I had mine in the fridge overnight and then let it sit at room temperature for just under 10 mins before using. – beat the butter and sugar until creamy. Add the egg and 1 Tbsp of the flour mix and beat until smooth. – chop the chocolate into small pieces. Place in a double boiler with the spices and butter and allow to melt slowly. 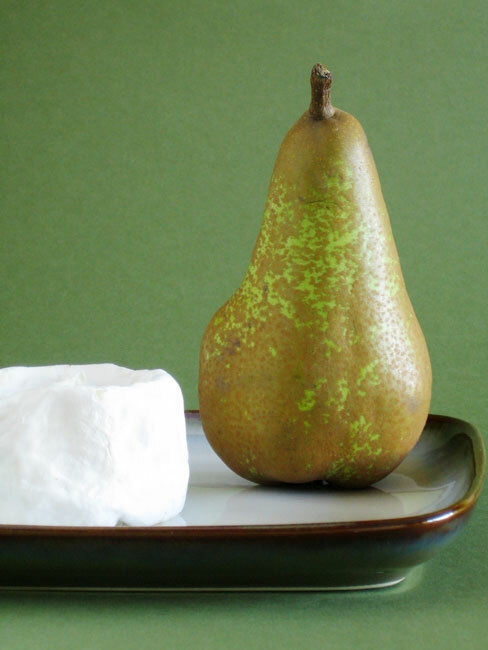 – heat the cream and sugar for the pear over a low heat until sugar has dissolved. Add pears and increase heat. Bring to a simmer and cook pears for about 15 – 20 mins, caramelising the pears. remove from heat and allow to cool. -When choc is melted and smooth, add whiskey and egg yolk and mix well. Remove from heat and allow to cool slightly. – whip egg whites until stiff. Vigorously stir in a big spoon of the egg white to life the mixture then gently fold in the rest of the egg white in 3 or 4 goes. 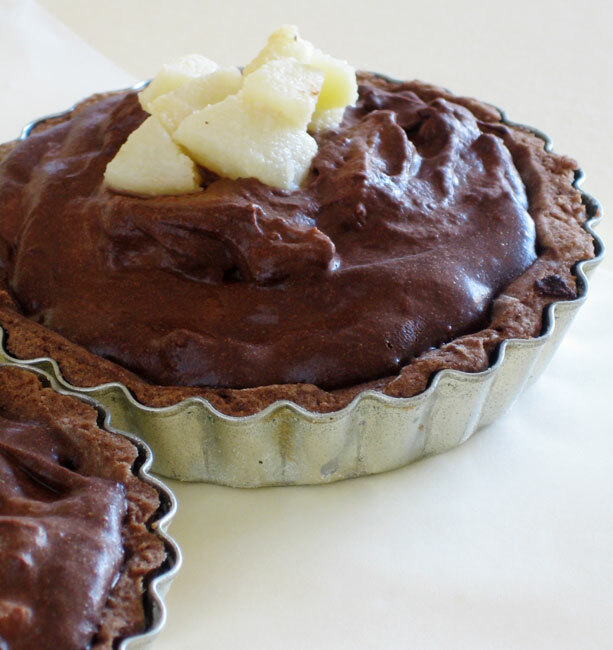 – carefully add pear, reserving some for a garnish, and incorporate well, being careful not to flatten the chocolate mousse. 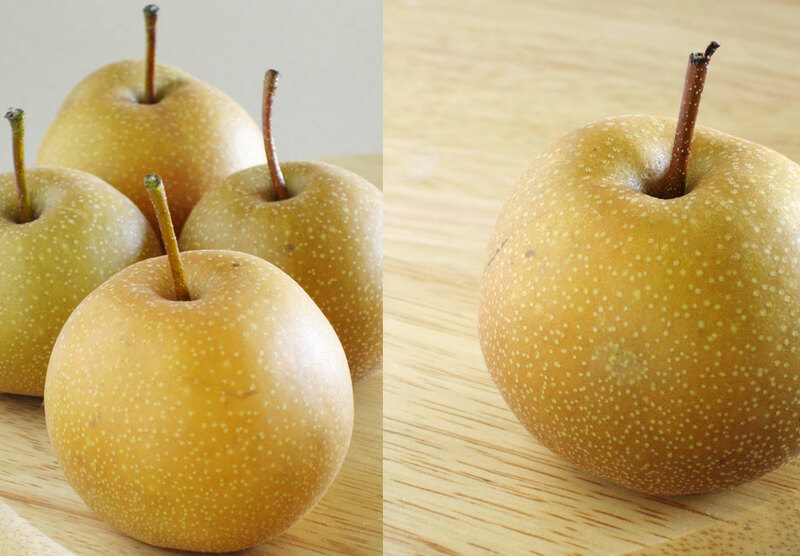 – divide between tart shells, garnish with remaining pear and refrigerate for at least 4 hours.